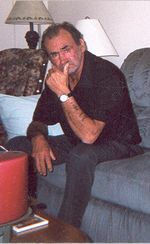 Robert H. “Bobby” Lane, age 63, of Cleveland, died at his home on Friday, July 16, 2004. Mr. Lane was born on September 26, 1940 in Welch West Virginia to the late Sarah Brewster Crigger of Bluefield, Virginia and Lacy Lewis Lane of New Jersey. Mr. Lane was a coal miner in West Virginia and a Machine operator and Independence Stamping in Cleveland. Survivors include his beloved wife Bonnie; dear children David, Bryan, Brad, Marty, Robin and Melody; grandchildren Brandy, Ashley, Michael, Marty, William and Nathan; brothers and sisters Doris (Wesley) Reed, Donna (Ronald) Dunn, Chink (Pam) Wilhite. Funeral Service 11:00 a.m. Tuesday at Bodnar-Mahoney Funeral Home & Cremation Service 3929 Lorain Ave. Cleveland (216) 631-3075 where the family will receive friends 5-7 p.m. Monday. Interment Riverside Cemetery.